Turning NO to ON isn’t just a trick of shifting the placement of letters, it’s a paradigm shift. Responding and focusing with mindfulness in parenting can shift a child from NO to Yes and from Off to ON so that using mindfulness in interacting with your child can move your child from NO to ON. Mindfulness integrates these two processes such that a quantum shift can occur moving the child out of obstructive, negative, stopped interactions into opportunities of Yes, an openness to learn, and being turned ON to the experience and thread of life. It creates a path to move-through in an easy positive way. Turning NO to ON through the perspective and action of mindfulness, to shift the child’s perspective, attitude and energy. You are shifting the paradigms that organize how to act in a given situation. The concept is about weaving and connecting in a new and upleveled way to shift the perspective and energy. This is a whole new concept of how to BE with your child while guiding his behavior to create patterns that move him forward and upward toward his goals in a secure and empowering way. It’s an evolution in consciousness. If you think about how and where you get stuck in your own fears, blocked patterns, and limitations you can see how to shift your perspective and attitude. This shift opens up a hidden path or way through your circumstance to a successful resolution. This is what Turning NO to ON is about, using mindfulness and paradigm shifting as a way to navigate the sometimes stormy waters of parenting. My new book Turning NO to ON: The Art of Parenting with Mindfulness is a rich resource for developing your own skills at employing mindfulness in your personal development. Then through role-modeling you will be applying your new skills to your circumstances and parenting and guiding your child down a new internalized path of health and empowerment toward success. I hope you get a chance to buy it and use it – and that it becomes your go-to resource for guiding your personal and parenting growth and success. Let me know what you think, once you get a chance to read it. The thing that is so fascinating about figure ground perception is the fluidity in which our senses differentiate between figure and ground. If you are watching TV and there are men working outside on the street – your hearing differentiates between the sound attributed to the work outside (background noise) and the TV audio of the storyline of the program you are watching. Visually our eyes determine figure and background to make sense of portraits or any visual field. For wine tasting, individuals distinguish between the background of the wine – dry or sweet, while identifying specific flavors attached to various herbs and fruits – clove, blueberries, or citrus. This is built into our very complicated sensory system to assist us in negotiating life. From a psychological perceptual perspective, figure-ground perception applies to paradigm shifting; the figure or foreground of something to which we pay attention or are bothered by and the ground or background of our own values paradigm or belief system. Fluid shifting between figure and ground is required for negotiation, relationship and communication processing, and working-through in the therapeutic environment. This concept was first applied with these terms to psychotherapy and health promotion by Fritz Perls in his book Gestalt therapy verbatim. It has since been applied to business communication development in negotiation and communication in leadership training programs. The common visual example of this is the vase (figure) and the two profiles surrounding the vase (background). 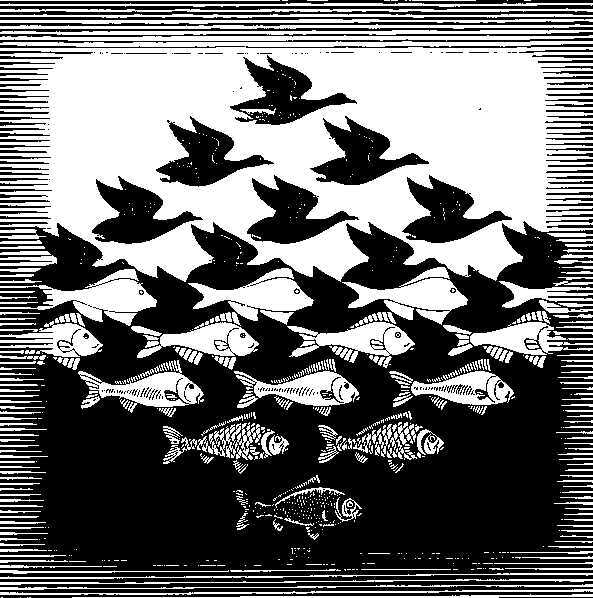 Escher drew many optical illusion pictures that show the transition from figure to ground. When we understand that our style of being in the world is the background that moves us to act and believe in specific ways, we can then be open to shifting our perceptions such that we may have a flexible style of perceiving. This keeps us open to new information as it presents itself. The figure of our attention – the thing that pushes us forward or stops us in our tracks – is what causes us to shift our perception from ground to figure and allows for paradigm shifting. The reason to develop the skill of paradigm shifting is to increase your capacity to respond in a full and present moment way to the events in your life to create your most successful path. Attention, intention, perspective, and attitude all affect how we interpret the information stimuli that cross our path. This idea of figure and ground and paradigm shifting offers a way in to the rich experience of perception available to human beings. Perspective in relationship, interaction, development, and philosophy allows for the same degree of richness found with lens modification in photography. There is so much more to really see, know, and understand. Opening the lens opens your perspective in the richness of relationship, development, and understanding. This style of being in the world allows for interaction across fields, innovation, collaboration, and true understanding. To begin the process of paradigm identification and paradigm shifting you can begin by identifying figure and ground in your sensory environment. Then you can apply the process to your interactions and your value and belief perceptions. By doing this you can see there are many more places where you may agree with another than originally thought and you can have an increased understanding of another’s perspective.